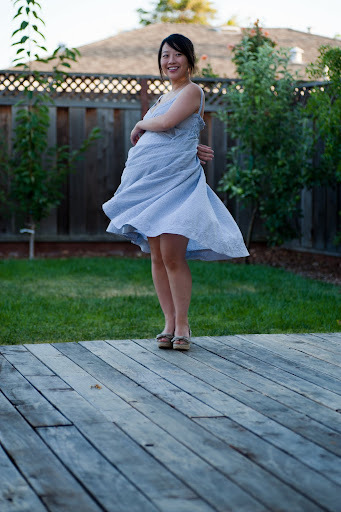 Twirl Dress – Adult version! Have you seen this most whimsical dress from Wildflower and Whimsy? Dont you think its the cutest dress ever? When I saw it, I really wanted one for myself and Kaylee! While it would be a while for Kaylee to be big enough for cute dresses, I can wear one now 🙂 I made one that I can wear now and also after pregnancy. I followed her tutorial to cut the circle skirt. I have just ordered a ruffle feet from Amazon, since making little girl dress would require lots of ruffling. But I decided to put a biase stripe instead as the hem of this skirt to make it more suitable for an adult and less heavy. The skirt is cut so that its higher in the front and lower in the back, so the bias stripe was made to make sure that all edges are enclosed (kind of like a french seam) and the skirt hem looks finished from inside and out. It took a while to iron the long bias stripes! I think the cut of the dress drapes quite well over a big tummy, dont you think so? 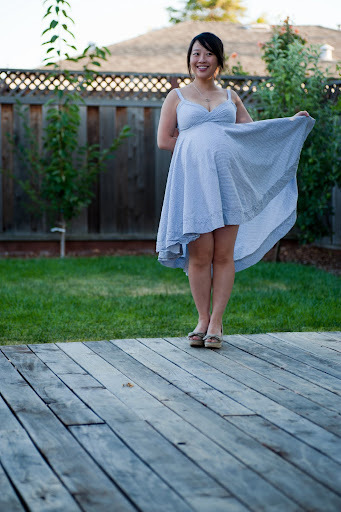 The bodice of the dress is actually made from McCall 5652, which is actually a really great summer maternity dress pattern. I lengthened the back piece a little to allow me to put in a elastic band and shirring it a little. The edge of the top is enclosed by bias strips which extends into a strap. 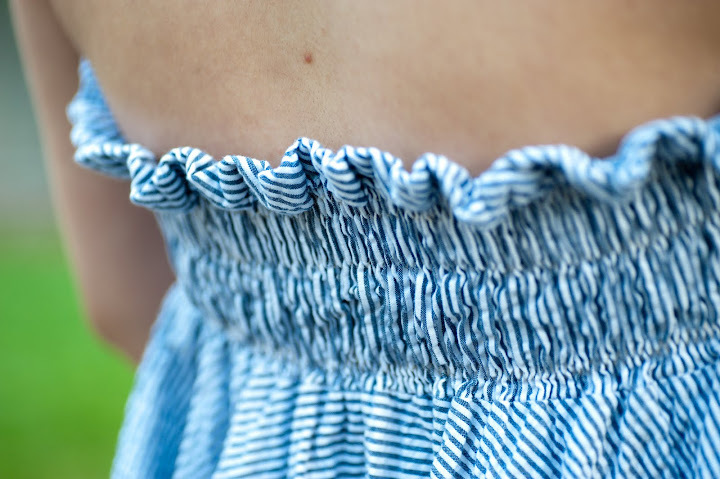 The material is an all cotton seersucker, and no bra required — making the dress super comfortable! I love wearing it, it makes me very happy and feeling very floaty. I still have a lot of the material left to make a cuter version for Kaylee, I cant wait until next summer! When my mom saw this dress, she commented that back in her days, all the skirts and dresses has to have even hemlines, making it quite difficult for pregnant women’s hemlines. What is your opinion of dresses that has shorter hemline in the front? Does it look weird to you? do you think it makes your legs look longer, or shorter? This entry was posted on Friday, August 12th, 2011 at 10:36 pm	and posted in finished pieces. You can follow any responses to this entry through the RSS 2.0 feed. 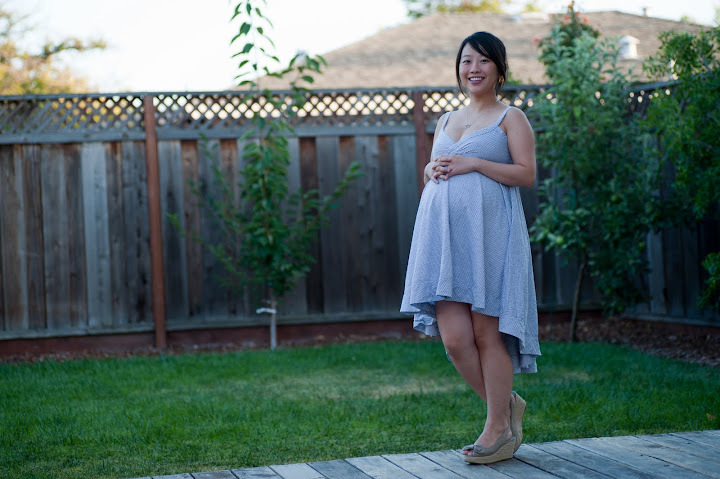 Wow – I want that dress and, ahem, my pregnancy days are way behind me! Actually, one of the things that makes that dress work is the uneven hem in the front – it makes it special and different. Thanks! You can still make one for normal wear!!! I think it will hide a full tummy well too! Love it on you, Jue! This is darling! I love the uneven hemline! 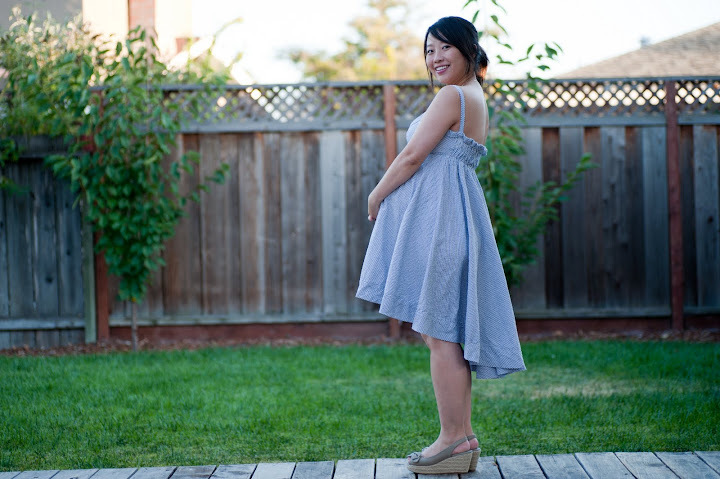 Cute maternity dress!I agree with the others, the uneven hemline works very well! 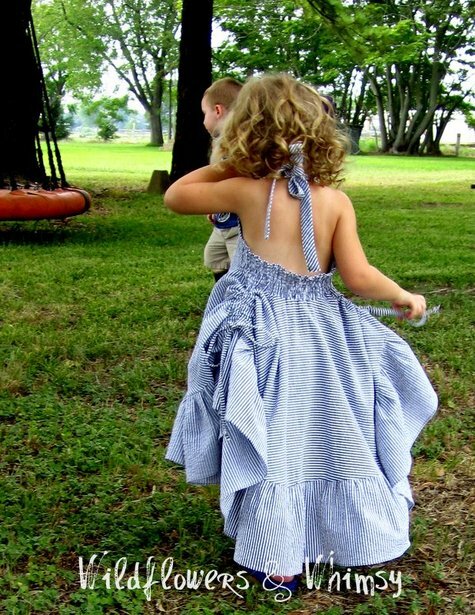 Love the idea of a mommy and a child version of this dress. Thanks!! Hopefully it wont look too tacky! Thank you!! I was a little worried that the “mullet ” is a little too much… I had cut it for without a baby bump, and baby bump made it even more uneven! Glad it works still! Love the dress and love your blog. I’ve always thought all the good dress tutorials were for childrens clothes and wouldn’t it be great to follow those instructions and make an adult version. Of course never got around to it thinking I would look like I raided my daughters closet. Great job. Now I’m off to try my version. Hahahaa, yay! Id love to see your versions of kiddo clothing. I think the key is to lessen the cute stuff like ruffles and gatherings, but sometimes thats hard to do cos they are sooo cute! I absolutely love it! & Thanks for linking to me! I am so happy to see this version! Would love to have you share this for Fashion and Flair Fridays on my blog if you are interested! I think my readers would love your version or if you don’t have time would you mind if I shared your pics? Email me @ wildflowersandwhimsy@yahoo.com Look forward to hearing from you! Great dress. It’s all the rage to have uneven hemlines here in Australia (we’re a bit slow with keeping up with fashion here), I can’t wait to make one for my daughter. Haha true true! When you are beached whale, all you want to do is float!